One place for all the islamic festival in 2015 including, dates for Eid ul-fitr and Eid ul-Adha. We recently created the new Islamic Calendar 2015 check out all the dates there too. For Islamic festivals of 2014 go here. Another new year and more festivals, all religions have festivals and Islam is no different. There are two major celebrations in Islam which are the two Eids. One is straight after Ramadan, Eid ul-Fitr and the other is Eid ul-Adha which falls in the month of Hajj and lasts for three days. There are more dates for your diaries not just the dates for Eid. 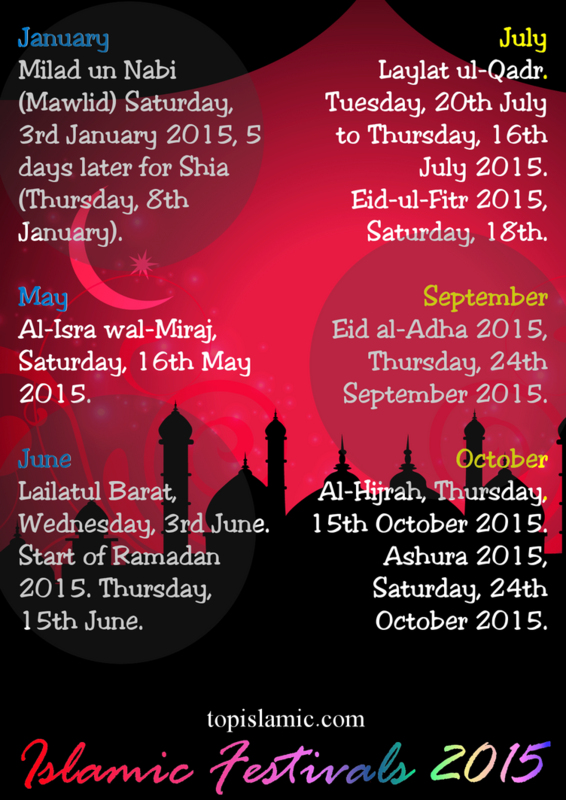 This list has all the Islamic festival dates for 2015, as usual I’ve also included a poster that you can download. Please note: we have remained impartial in showing the dates, we are aware of the difference of opinion in events and dates so please try to avoid discussion on those areas. This is the list of all the festivals in Islam for 2015 starting from January. Milad un Nabi (Mawlid) Birthday of the Prophet (saw), this is on the 12th of Rabi-ul-Awwal. Saturday, 3rd January 2015, 5 days later for Shia (Thursday, 8th January). Al-Isra wal-Miraj, 27th Rajab. The journey of the Prophet (saw) to the heavens. Saturday, 16th May 2015. Lailatul Barat, 15th Shaban. The night of records, mostly observed by those of the Indian sub-continent and muslims of Turkey. Wednesday, 3rd June 2015. Start of Ramadan 2015. 1st Ramadan 1436. Thursday, 15th June. Laylat ul-Qadr (Night of Power), the last 10 nights of Ramadan 21st – 29th Ramadan. Tuesday, 20th July to Thursday, 16th July 2015. Eid-ul-Fitr 2015, 1st of Shawwal 1436. Saturday, 18th July 2015. Eid al-Adha 2015, the second of the two Eids. This is in the month of Dhul-Hijjah (10th). Thursday, 24th September 2015. Al-Hijrah, the Islamic new year 2015. This will mark the beginning of 1437 Hijri (1st Muharram). Thursday, 15th October 2015. Ashura 2015, this is on the 10th of Muharram. There are many virtues of this blessed month. Saturday, 24th October 2015. We pray that you have a fruitful new year, one that is blessed with mercy and forgiveness. Please share with your friends and family and remember us in your duas. Here’s the free poster with all the Islamic festivals of 2015. Alhumdulillah….. very useful post by this people can come to know about the festivals. People can travel to Makkah and Madinah for Umrah during the festivals to make festival more precious.